Building a giant replica of a tree from wood might sound like a strange or even wasteful idea, but not in the hands of artist John Grade. The Seattle artist created Middle Fork, a suspended sculpture of a living, 150-year-old giant hemlock that was painstaking crafted by hand from 500,000 blocks of reclaimed wood. 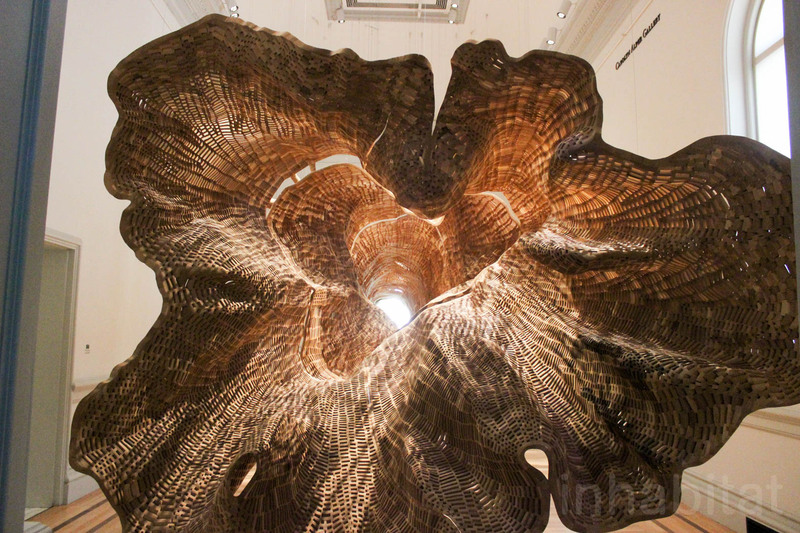 Currently on view at the Washington, D.C. Renwick Gallery, the 40-foot-long sculpture not only captures the tree’s unique spirit and contours, but also explores themes of environmental degradation and man’s relationship with nature. No trees were harmed or felled in the process. Featured as part of the Renwick Gallery’s Wonder exhibit, Middle Fork was modeled on an 85-foot-tall, approximately 150-year-old hemlock growing in the Cascade Mountains—Grade specifically sought a tree that was near the same age as the Renwick Gallery, which was built more than 150 years ago. 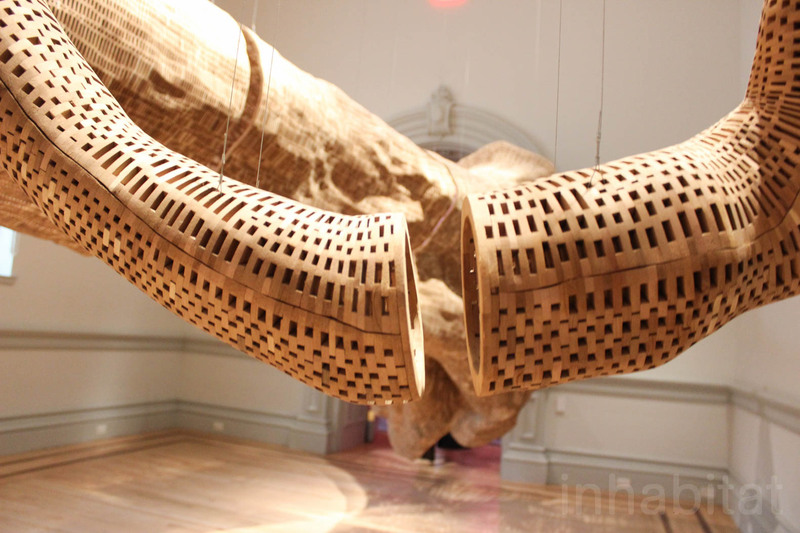 Suspended horizontally at eye level, the retrofitted sculpture fills the entire gallery room and offers viewers an unusual view through the middle of the porous and hollow trunk, from the roots to the branches that radiate outwards in all directions. Middle Fork was painstakingly crafted over the span of a year, starting with the initial casting of the hemlock. Insistent on not using digital tools to copy the tree’s dimensions, Grade scaled the living tree with a group of eight to apply layers of foil and plaster and create an accurate cast, while ensuring the tree was carefully protected. Once the tree was cast, the artist worked with a team of artisans and hundreds of volunteers to assemble the sculpture. Half a million, quarter-inch salvaged cedar blocks were individually glued onto the plaster mold. The old-growth cedar segments were reclaimed from a bridge that was being torn down. The inner mold was removed once the pieces were in place and bonded together. The public’s involvement in building the sculpture was an important part of the Middle Fork Process. During the project’s assembly at MadArt Studio, Seattle’s large-scale artists’ workspace, people would be invited directly off the street to participate. “By responding to the character of the molds made from the tree, along with the process of cutting and shaping each small part of wood and adding it to the sculpture, the hope was that people building the sculpture would develop an intimate connection to the particular form of this tree and experience a substantial connection to the finished sculpture,” says a statement on Grade’s website. Shortly after completing the large-scale Middle Fork exhibit, Grade also created a second smaller version of the original titled Middle Fork (Arctic). Grade traveled to northern Alaska where he cast a specimen of the elusive balsam poplar, a tree that’s also approximately 150 years old. Though the balsam poplar is the same age as the hemlock, its growth was stunted because of the Arctic’s harsh climate. The balsam poplar that was used as the model for Grade’s second sculpture was not harmed in the process and was assembled using reclaimed old-growth western red cedar blocks. John Grade’s Middle Fork installations will remain on view at the Renwick Gallery until May 8, 2016, after which it will tour a few other venues. Ultimately, the biodegradable sculpture will be laid to rest next to the original tree. 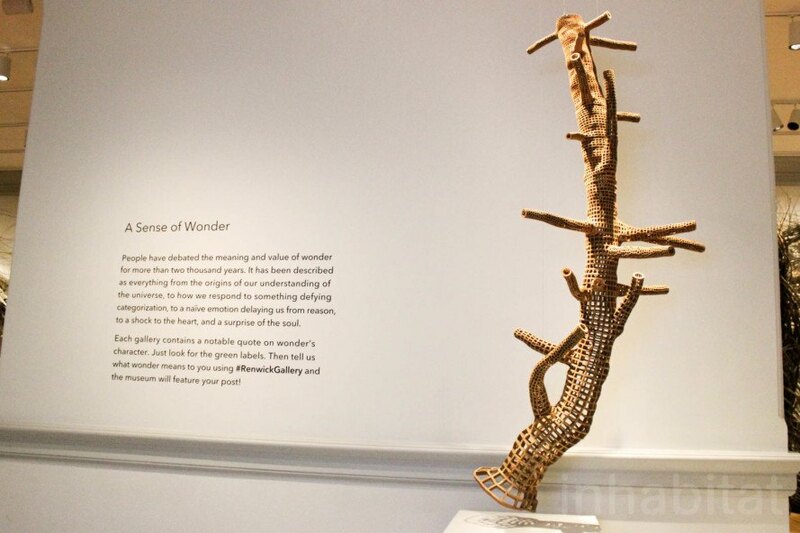 Featured as part of the Renwick Gallery’s Wonder exhibit, Middle Fork was modeled on an 85-foot-tall, approximately 150-year-old hemlock growing in the Cascade Mountains—Grade specifically sought a tree that was near the same age as the Renwick Gallery, which was built more than 150 years ago. 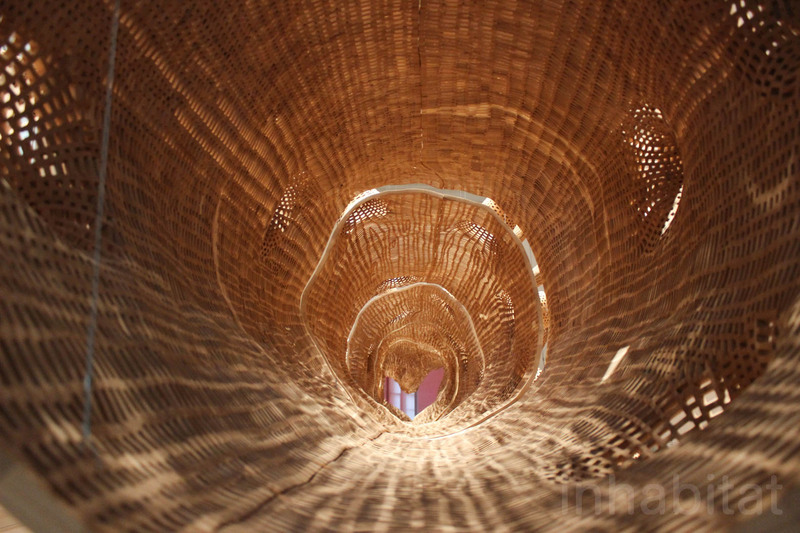 Suspended horizontally at eye level, the retrofitted sculpture fills the entire gallery room and offers viewers an unusual view through the middle of the porous and hollow trunk, from the roots to the branches that radiate outwards in all directions. Middle Fork was painstakingly crafted over the span of a year, starting with the initial casting of the hemlock. Insistent on not using digital tools to copy the tree’s dimensions, Grade scaled the living tree with a group of eight to apply layers of foil and plaster and create an accurate cast, while ensuring the tree was carefully protected. Once the tree was cast, the artist worked with a team of artisans and hundreds of volunteers to assemble the sculpture. Half a million, quarter-inch salvaged cedar blocks were individually glued onto the plaster mold. During the project’s assembly at MadArt Studio, Seattle’s large-scale artists’ workspace, people would be invited directly off the street to participate. “By responding to the character of the molds made from the tree, along with the process of cutting and shaping each small part of wood and adding it to the sculpture, the hope was that people building the sculpture would develop an intimate connection to the particular form of this tree and experience a substantial connection to the finished sculpture,” says a statement on Grade’s website. View from the roots towards the top portion of the tree. View into the hollow sculpture from the "top" of the tree. Sign accompanying the Middle Fork (Cascades) installation. Shortly after completing the large-scale Middle Fork exhibit, Grade also created a second smaller version of the original titled Middle Fork (Arctic). Grade traveled to northern Alaska where he cast a specimen of the elusive balsam poplar, a tree that’s also approximately 150 years old. Though the balsam poplar is the same age as the hemlock, its growth was stunted because of the Arctic’s harsh climate. The balsam poplar that was used as the model for Grade’s second sculpture was not harmed in the process and was assembled using reclaimed old-growth western red cedar blocks. Middle Fork (Arctic) close up. Sign accompanying Middle Fork (Arctic).